WASHINGTON — Border Patrol arrests plunged to a 45-year low, but detentions by deportation officers away from the U.S.-Mexico border soared during President Donald Trump’s first months in office, as his efforts to overhaul the nation’s immigration system took effect. Overall, ICE said deportations totaled 226,119, a decline of 6 percent from the previous year, but that number masks a major shift away from the border. ICE often takes custody of people at the border before deporting them; the sharp drop in Border Patrol arrests means fewer people to remove. Reasons for the precipitous drop in border arrests are unclear, but Trump’s election may have deterred people from trying. ICE said “interior removals” — people deported after being arrested away from the border — jumped 25 percent to 81,603. And they were up 37 percent after Trump’s inauguration compared to the same period a year earlier. In February, former Homeland Security Secretary John Kelly, who now serves as Trump’s chief of staff, scrapped the Obama administration’s instructions to limit deportations to public safety threats, convicted criminals and recent border crossers, effectively making anyone in the country illegally vulnerable. At the Capitol on Tuesday, a group of 34 House Republicans asked Speaker Paul Ryan to act this month on legislation dealing with 800,000 young immigrants brought to the United States as children and now living here illegally. Reasons for the precipitous drop in border arrests are unclear, but Trump’s election may have deterred people from trying. 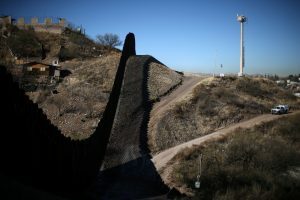 Trump has yet to get funding for the first installment of his proposed border wall with Mexico and the number of Border Patrol agents declined to less than 19,500 as the government struggle to fill vacancies continued during his presidency. The numbers released Tuesday provide the most complete statistical snapshot of immigration enforcement under Trump. And they show that deportation officers are taking his call for an immigration crackdown to heart, even without the funding increase that the president has sought from Congress for more hiring. Trump campaigned as an immigration hard-liner, accusing Mexico of sending rapists and other criminals to the U.S. and promising to build “a great wall on our southern border.” As president, he has signed a series of travel bans aimed at curtailing who can enter the country, pushed to overhaul the legal immigration system and tried to crack down on so-called sanctuary cities that refuse to share information about illegal immigrants with federal authorities. The sharp drop in border arrests may be used by Trump’s critics to question the need to spend billions of dollars on a border wall and hire 5,000 more Border Patrol agents. Officials said they believe a wall is still necessary. Homan said that, every time a wall barrier has been built, illegal crossings have decreased significantly. Despite the overall decline in border arrests, the numbers have increased every month since May — largely families and unaccompanied children. About 58 percent of Border Patrol arrests were people from countries other than Mexico — up from 54 percent from a year earlier — largely from Central America. Starting around 2011, large numbers from El Salvador, Guatemala and Honduras began entering the country in South Texas, which replaced Arizona as the busiest corridor for illegal crossings. Ronald Vitiello, Customs and Border Protection’s acting deputy commissioner, said he was “very concerned” about increases in families and children crossing in recent months. During the fiscal year, which included the Obama administration’s final months, border authorities stopped people traveling as families 104,997 times on the Mexican border and unaccompanied children 48,681 times. CBP also said inspectors at land crossings, airports and seaports denied entry 216,370 times during the fiscal year, a decline of 24 percent from 2016. Border Patrol arrests occur outside of those official points of entry. CBP, which has faced allegations of excessive use of force, said its employees used firearms 17 times during the fiscal year, down from 27 the previous year and 58 in 2012. They used “less-lethal” devices such as pepper spray 979 times, up from 947 a year earlier. CBP said its employees were assaulted 847 times, up from 585 a year earlier and less than 600 each year going back to 2012. Spagat reported from San Diego. AP writer Anita Snow contributed from Nogales, Mexico.